Well it has been 4 long weeks since my first figure competition. I had no idea the aftermath that would follow. About 3 weeks before my competition I starting getting these extreme cravings for sugar specifically “cupcakes“. This was kind of strange; I have never really been a big sugar eater, and never really craved it. I just figure it was due to not being “allowed” to have it…so I wanted it. This stuff should be banned! homemade chocolate chip cookies (well I cooked them in my oven) at least 3 days a week (who ever invented the tub of cookie dough should be shot) soda, and just about anything else I should not be eating as long as it had some chocolate or frosting it was fair game. I just can’t seem to get enough. I think that my body has actually become addicted to the stuff. I really started to take notice this week when I looked in the mirror…my abs were gone. What the hell! I had worked so hard for so long and just like that “belly by HoHos” took over. So I decided after making light of the situation with a couple of guys and my trainer at the gym it was time to remove the sugar again…go cold turkey…Stevia here I come. This has been much harder than I expected, but it has been 3 days and my abs are starting to make small appearances, so that gives me hope that I didn’t ruin all my hard work. It did however put it in prospective as to how fast your body and mind can revert to destructive ways. I wanted to know a little more about why this would happen, when I have never really eaten much sugar or craved it. In short and really simple: The sugars are very easy to digest, the body doesn’t have to work very hard to gain energy from them. Unlike when you eat proteins and complex carbs the body has to work much harder to retrieve the energy store in them. Basically the body is lazy, so when you take in sugar and it sees how easy it was to get energy; it just sends a message to the brain to get more of that easy energy source…hence the cravings for sugar. So I am getting back on track and now know what to expect after my next competition. Good for you for getting back on track right away. 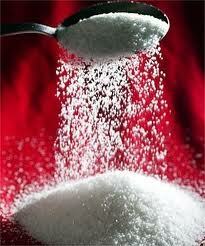 Sugar is evil, it’s so tasty, but so quickly destructive. I find myself craving it a lot (especially chocolate). I allow myself small amounts once a week, in my allocated cheat meal. The idea of the cheat meal is usually more satisfying that the actual treat itself and I always find the treat makes me just crave sugar more. Evil, evil sugar! Oh Liz, I hear you. I struggled with similar stuff, but actually during prep. I am embarding on operation moderation. Trying to move away from foods being forbidden so I don’t get crazy. Just blogged about it today! I really need to find a balance and not live in a sense of deprivation. Will be interested to see how this unfolds for you.